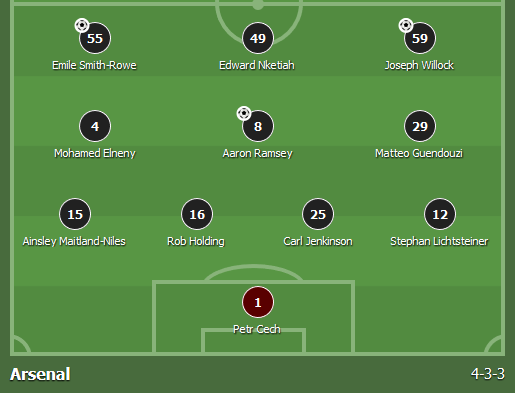 Arsenal lead 0-3 at the moment, but that line-up! Am I insane or I see 6 English/UK players in the starting 11? Emery is really an insane guy who might turn Arsenal into a good side. Just to mention add that I have no clue who are those 3 in attack, Ainsley Maitland-Niles and Rob Holding except Jenkinson. Winning EL title is a safe way to reach CL and also brings money and prestige, puts you in the history as a winner no matter how much players last 15 years mock and insult the competition until they found themselves there playing, not to mention winning it. Atlético players were the latest ones who ate their crap within few months last season. Jovic with a goal in the first minute against Marseille. Yeah, Jovic two and two own goals. Frankfurt is a very well build team, one of the reasons I still have trust in Kovac. But he needs an sporting director who makes him understand what kind of team Bayern is and stops his Vogt and Rebic bs. This is actually a pretty interesting thought on the issue. I have to wonder if perhaps one of Kovac and Brazzo would do okay on their own - say Kovac with Sammer as SD or Brazzo as SD with Pep (or naturally Heynckes) - I think that'd probably work better. Does make me think that perhaps it's the combination of the two that's exacerbating problems. Not saying Kovac is perfect by any means but I do kinda wonder if we had an SD who seemed like he had a clue what he's doing if things would be better. ideally both need to be replaced . Let's hope they aren't punished sporting wise by UEFA for the behaviour of their fans today. Some nasty scenes today. Flares, sounds of explosions, multiple pitch invasions, throwing stuff at Lazio fans. In the meantime Lazio fans were in the minority in the stadium. RB Leipzig would qualify as it stands now ! !